One of our favorite weather apps around here, Amazing Weather, just got bumped with some Windows Phone 8 support to version 4.0. Now appropriately titled Amazing Weather HD, the app weighs in at an impressive 80MB. Reason? It’s all of those fancy high-resolution animations. The Live Tiles also now come in three sizes: tiny, regular and doublewide, in addition to having their graphics up-scaled for the new higher resolution devices. Text and imagery are now much sharper looking with the updated Tiles. Unfortunately for this release, developer EizSoft did not go for lock screen temperature, billboard forecast, or lock screen wallpaper. We’re sure that’s probably coming down the road but you won’t get those coveted WP8 features in this update. Other than that, Amazing Weather HD has the usual gambit of options: location-based weather that always updates based on your GPS coordinates, multiple pre-defined locations, notifications for severe weather, animated weather maps (radar, satellite IR4, visibility), hourly weather and charts. Launch time of the app hedges right at 2 seconds from tap to viewable forecast, which is quite fast in our books. While there are some other great forecast apps out there, Amazing Weather HD is easily our top. You can pick it up in two versions free and paid ($1.49). Currently only the paid one has the update though we expect ‘Lite’ to get it as well. 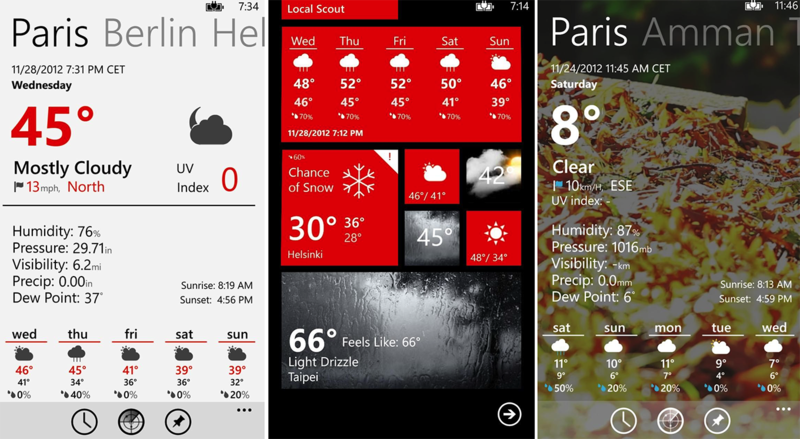 Amazing Weather HD will work on Windows Phone 7 and 8 devices. Highly recommended.